New Doom video shows off insanely violent "glory kills"
It turns out that there is more to "Glory kills" than just killing gloriously. 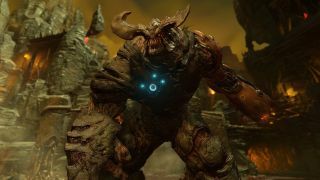 As Bethesda explains in the latest Doom video, they're over-the-top melee attacks that enable players to get up close and personal with enemies without slowing the game's frantic pace. They are, of course, gloriously gory—but also extremely fast, and designed specifically so that they won't break the rhythm of the game's "push forward". Glory kills remind me a bit of the melee kills in Serious Sam 3: BFE, but they're much more sophisticated than just "static finishers." There's a large number of them of them in the game and they change depending upon your position in relation to your victim, and they won't interrupt the speed of the slaughter. You can step back and bear witness to your handiwork if you like, but things happen quickly enough that it's just as easy, and probably more tempting, to move on to the next guy and do it again. "We have strict time limits on how long [glory kills] can last," Chief Technology Officer Robert Duffy says in the video, which was apparently recorded at E3 but just posted at Bethesda.net today. "They’re hundreds of milliseconds, just because you want to keep the player moving." Now, me, I'm a practical man. Punching things is something I do when I'm all out of bullets. As long as I have a loaded gun, or even better an assortment of guns, I think I'll stick to shooting stuff, thanks. You? Doom is slated to come out in the spring of 2016.